Warning: This is an old version. 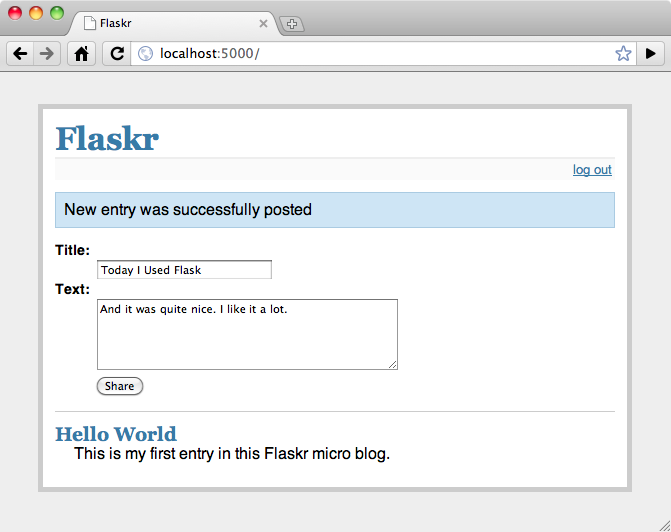 The latest stable version is Flask 1.0. Let the user sign in and out with credentials specified in the configuration. Only one user is supported. When the user is logged in, they can add new entries to the page consisting of a text-only title and some HTML for the text. This HTML is not sanitized because we trust the user here. The index page shows all entries so far in reverse chronological order (newest on top) and the user can add new ones from there if logged in. SQLite3 will be used directly for this application because it’s good enough for an application of this size. For larger applications, however, it makes a lot of sense to use SQLAlchemy, as it handles database connections in a more intelligent way, allowing you to target different relational databases at once and more. You might also want to consider one of the popular NoSQL databases if your data is more suited for those. Continue with Step 0: Creating The Folders.